UPS devices use batteries to store electrical energy which can be discharged through an inverter assembly when the mains power supply fails or fluctuates. The batteries may be internal and even user hot-swappable or supplied in an external battery cabinet. The inverter section converts the battery DC output to an AC waveform of the type required to power servers and computers. The inverter may be in standby, line interactive or on-line mode during normal operation and it is this ‘mode’ that defines the three types of UPS device (Wikipedia) available. A short summary is provided below. Standby UPS provide basic power protection when the mains power is present and normally through either an EMI/electrical noise filter or surge suppressor. The internal battery is charged and the inverter is switched off. When the mains power supply fails, the inverter activates and powers the load from the battery. There is a small break in output power which can be accepted by modern server and computer power supplies. The inverter output waveform may be a square or stepwave and again suitable for most server and computer power supplies. Standby UPS units are typically 300VA-1.5kVA in size. Provide intermediate power protection and operate in a similar way to standby UPS but with the additional of an AVR (automatic voltage regulator – buck/boost transformer with taps) which when mains power is present steps up/down the incoming mains voltage to reduce inverter usage. The inverter is powered but not engaged to power the load till the mains power fails or fluctuates. There is a switch over period of typically 2-4ms and the waveform will be an AC step-wave or sinewave. Some large line interactive UPS may provide the option for plug-in external battery packs to lengthen the runtime available. Line Interactive UPS devices are typically 400VA-2kVA in size. Provide the ultimate power protection. Firstly the inverter is rated for continuous running is always powers the load under normal conditions with a ‘break-free’ AC sinewave output waveform. When mains power fails the battery set supplies a rectifier which in turn supports the inverter. The battery set may be internal or external. Online UPS systems also include both single phase (UK 230Vac 50Hz) and three phase UPS units (400Vac 50Hz). A final safety measure is built-into an online UPS device known as an automatic or static transfer switch. This will transfer the load to the mains power supply bypassing the UPS if the inverter is overloaded during a high power server or computer start-up or the UPS device develops a fault condition. Estimating the load in VA or Watts can be tricky and may require expert advice and onsite measurement. Datasheets can be useful but tend to lead to oversizing as the power supply ratings are always given at maximum rather than a truer running figure. One you have the figure you can then consider runtime. This is the amount of battery time required either to run through momentary power breaks, wait for a local standby power generator to start or to power your network servers and computers for a long period and potentially several hours. UPS devices will provide a longer runtime at a lower load than at full load. This can help when deciding on a UPS unit as a single larger UPS may be lower in cost than a right-sized UPS system which may only have a short duration battery at full load and/or require a battery extension pack. When you are looking to install a UPS device the number and type of output sockets will be important. Some small UPS are available with BS-style UK sockets, whilst others use IEC320 sockets or hardwired connections. You may also need to consider adding additional Power Distribution Units (PDUs) in order to power your servers and computers. Standby UPS tend to be desk, tower or wall mount. Line interactive and Online single phase UPS tend to be tower or rack mount (or dual combination) units. Larger three phase UPS tend to be floor standing and either a mono-block (all-in-one) unit or a modular UPS system. Most UPS devices include a USB port which can be used to communicate with UPS monitoring and shutdown software on a network server or computer to provide alarm messages and automatic controlled system shutdown. Some line interactive and online UPS also allow for a slot-in SNMP card that allows the UPS to be given an IP connection on a network for remote monitoring. A final note when selecting UPS is that the price very much reflects the technology of the UPS device. Standby are lower in price than line interactive systems with online UPS units commanding a premium price. UPS units will require an adequate air flow around them to allow for heat dissipated by the system itself and the battery as it is charged/discharged. Whilst the electronics will work at up to 40degrees Centigrade, the optimal temperature range for a battery is 20-25degrees Centigrade. Battery life starts to halve for every one degree Centigrade rise above 30. UPS efficiency can also be important as a consideration as UPS unit will cost money to run. The higher the efficiency the lower the heat output and running costs. Energy efficiency is normally more important as the UPS device increases in size but should be considered even for smaller UPS systems. 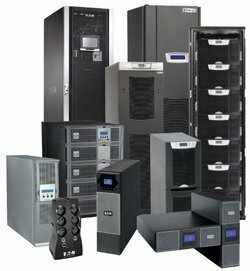 EcoPowerSupplies is an independent UPS supplier and can provide the best advice when selecting UPS units for your servers and computers from many of the leading UPS manufacturers and brands. Call us on 0800 612 7388 for more information or visit our website and use our UPS device selectors.